a zest of magnetic fields? How do stars like the Sun form? 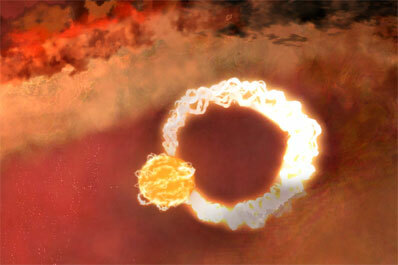 How are planetary systems born? To answer these questions, astrophysicists need to find out Nature's recipe to turn vast cosmic clouds of gas into accretion discs and into stars and planets. One of the crucial ingredients in this recipe is likely magnetic fields. 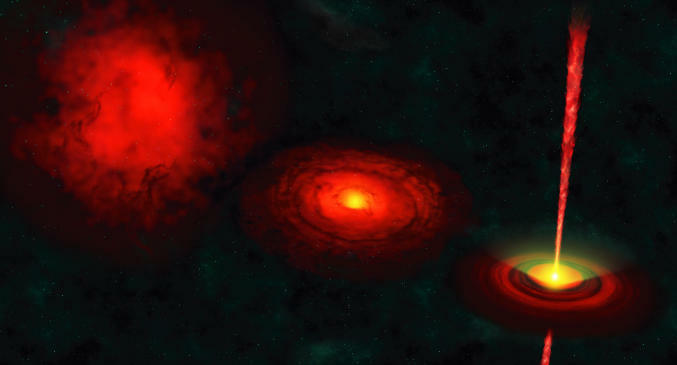 An international team of astrophysicists  has just succeeded at mapping the large arches and funnels that magnetic fields weave between baby stars and their accretion discs. These observations should yield more accurate models of how new-born stars interact with their accretion disc to form planetary systems such as our own. These results are published in the Monthly Notices of the Royal Astronomical Society. 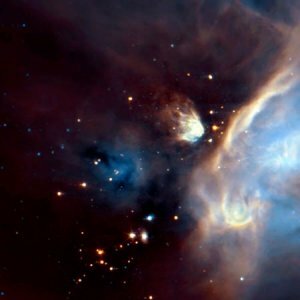 Where do stars come from and how are they born? This question is all about origins: the origin of stars and their planets, the origin of life in the universe. We know that our Sun has at least one planet with life, Earth, but stars other than the Sun may also have the same potential. Stars are born in vast cosmic factories known as molecular clouds: huge volumes of gas, mostly hydrogen and helium, richly laced with complex organic molecules and ice-covered dust grains. The star formation process in these clouds produces clusters of hundreds to thousands of stars. An international team of astrophysicists  led by JF Donati (from CNRS/Observatoire Midi-Pyrenees in Toulouse, France) looked at one of the star nurseries closest to our Earth to try and understand better how stars like our Sun form. Located in the constellation of Ophiuchus, the particular baby star they scrutinised is named V2129 Ophiuchi. Despite being as hot as and about 2.5 times larger than our Sun (having not yet contracted completely), it lies at a distance of about 420 light years from us, making it roughly one million times too faint to be visible with the naked eye. It is only 2 million years old; scaling to human life, this is a baby star of only a few days with still 1 year to go to complete its transformation into a full grown Sun-like star with its surrounding planets. Stars like V2129 Oph form when a portion of the parent molecular cloud collapse under its own weight. In this process, the collapsing globule is progressively spinning faster as it contracts - just as a skater does by bringing his arms closer to his body. The original cloudlet is finally changed into a flat disc, called an accretion disc, whose core gives rise to a new-born star and the surrounding material to planets. This star-making recipe, originally proposed by Laplace a few years after the French revolution, is however only approximate: it predicts that very young stars should spin extremely fast, a property that observations do not confirm. We are obviously missing some of the recipe's basic ingredients. The ingredient we are missing is likely magnetic fields. Despite being present in Sun-like stars and generating spectacular phenomena such as the solar corona, magnetic fields no more than slightly affect the life of fully grown-up stars like the Sun. In star forming regions however, magnetic fields are likely much more powerful. Through invisible webs threading the protostellar cloud, magnetic fields succeed at controlling the dynamics of accretion discs, and produce light-year long jet-like pencil beams by deflecting some of the originally infalling material outwards and along the accretion disc spin axis. Magnetic fields also manage to evacuate the core regions of accretion discs in direct contact with the baby stars, and to guide the material from the inner disc rim onto the star through funnels like light through optical fibres. The physical details of this operation are crucial to understand the fate of a Sun-like baby star and its surrounding planets. By looking at the polarisation magnetic fields generate in the light of V2129 Oph, JF Donati and collaborators were able to map for the first time the large arches that magnetic fields weave in order to link the star to its accretion disc. Thanks to their work, theoreticians will design new models of how Sun-like stars and their planets form. This discovery was obtained thanks to ESPaDOnS , the new generation spectropolarimeter recently installed on the 3.6m Canada-France-Hawaii Telescope  atop Mauna-Kea, an extinct 4200m-volcano on the big island of Hawaii, in the middle of the Pacific ocean. Thanks to its unprecedented sensitivity, ESPaDOnS is able to detect the very small polarisation that magnetic fields induce in the light of distant stars. Jean-François Donati, Laboratoire d'Astrophysique de Toulouse-Tarbes, Observatoire Midi-Pyrénées, CNRS/Université Paul-Sabatier, 14 avenue E. Belin, 31400 Toulouse, France. Tel: +33 561332917, Fax: +33 561332840,email: donati[AT]ast.obs-mip.fr. This team includes JF Donati (Observatoire Midi-Pyrenees/LATT, CNRS/UPS, France), MM Jardine (University of StAndrews, UK), SG Gregory (University of StAndrews, UK), P Petit (Observatoire Midi-Pyrenees/LATT, CNRS/UPS, France), J Bouvier (Observatoire de Grenoble/LAOG, CNRS/UJF, France), C Dougados (Observatoire de Grenoble/LAOG, CNRS/UJF, France), F Ménard (Observatoire de Grenoble/LAOG, CNRS/UJF, France), AC Cameron (University of StAndrews, UK), TJ Harries (University of Exeter, UK), SV Jeffers (University of Utrecht, NL) and F Paletou (Observatoire Midi-Pyrenees/LATT, CNRS/UPS, France). ESPaDOnS was cofunded by France (CNRS/INSU, Ministère de la Recherche, LATT, Observatoire Midi-Pyrénées, Laboratoire d'Etudes Spatiales et d'Instrumentation en Astrophysique, Observatoire de Paris-Meudon), Canada (NSERC), CFHT and ESA (ESTEC/RSSD). First light occured at CFHT on 2004 Sept 2. CFHT operation is funded by Canada (NSERC), France (CNRS/INSU) and the University of Hawaii.